Are you one of those people who loves good beer and has been feeling the pull of the craft beer industry? Perhaps this is the year to follow your taste. Craft brewing has been on a sharp rise across the United States, driven in part by the rising popularity of specialty beers among younger drinkers. Studies show that millennials find craft beer more appealing than major, mass-produced brews. In a national survey, young adults said they regularly order a craft beer in a restaurant. Defining exactly what constitutes a craft beer is tricky, but generally it’s a brew that’s produced in small quantities (less than 6 million barrels a year) by an “independent” brewer not owned or controlled by a major alcoholic beverage company. 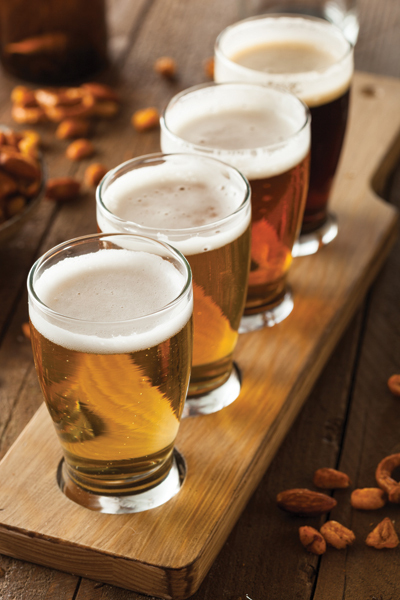 A craft beer’s flavor derives from traditional or innovative brewing ingredients and their fermentation, according to a craft brewer association. Data from the Brewers Association show that the number of U.S. breweries jumped 40 percent in just the past three years, to nearly 3,500 operations. The industry’s growth is in sharp contrast to action among big-label beers, whose sales have barely budged in recent years. Given New Orleans’ long association with a robust level of alcoholic beverage consumption, it might seem surprising that the city is not, in comparison with other cities around the country, a big beer town. In the late 19th century the Crescent City was considered the brewing capital of the South, with at least a dozen breweries operating in the city. But over time it became better known for hard spirits. That history has contributed to the popularity of traditional and craft cocktails in the local area and helped give rise to such now-popular events as the annual Tales of the Cocktail. Craft beer drinking, meanwhile, has taken a back seat, even as it gains an increasingly large following elsewhere. Brewers Association figures show that just 15 craft breweries operate in the entire state of Louisiana. And in terms of the number of breweries per 100,000 population, which is a commonly used benchmark for measuring growth, Louisiana ranks 49th among all states. Still, having produced almost 200,000 barrels of craft beer in the past year, the industry is a $460 million business, which shows that the state’s small core of brewers has some staying power. New Orleans sports two craft breweries at the moment. Seven-year-old NOLA Brewing operates on Tchoupitoulas Street, and Second Line Brewing opened last July on North Bernadotte Street. The brand-new Urban South Brewery is slated to open shortly on Tchoupitoulas Street, serving up such signature brews Charming Wit and Holy Roller IPA. Meanwhile, newcomer 40 Arpent Brewing opened in Arabi last year after first trying a Mid-City location. Other nearby breweries include the well-known and largest area craft brewer, Abita Brewing Co., in Covington, whose beers have become popular in restaurants and on grocery shelves throughout the region since its founding in 1986. State and local laws governing breweries are among the factors that determine how easy or difficult it will be to open a brewery and make a profit. Until recently, Louisiana law tended to hamper brewery development because it did not allow independent breweries to sell much of their product on-site. Successful craft brewers in states that are more hospitable to the industry are allowed to sell their beers not only to distributors who put the brews in restaurants and on grocery shelves, but also directly to consumers whom they serve in tap rooms at the breweries. The ability to sell to customers on-site gives brewers a revenue stream that helps them cover the costs of their overhead, including expensive production equipment. The narrow limits that Louisiana law imposes on tap room operation at breweries has largely kept this revenue stream out of reach for the state’s craft brewers. Under increasing pressure from those who would like to see the business expand, the Legislature last year modified the law slightly to allow breweries to sell up to 250 barrels of brew or 10 percent of their production a month, whichever is greater, in on-site tasting rooms. But the law left intact a provision that says breweries can only operate tasting rooms for a total of 20 hours per week. Craft brewers hope to see Louisiana loosen the law further, and the continuing interest in specialty brews seems to keep that hope alive. Meanwhile, openings of new craft beer drinking establishments show that demand for the beverages continues to rise. A World of Beer tavern opened on Julia Street in the Warehouse District late last summer, bringing a selection of nearly 50 tap brews. Tchoupitoulas Beer, also in the Warehouse District, served its first customers in the fall, offering German, American and local craft beers on tap. Some increasingly popular annual food-and-beverage events also are helping to boost demand for craft beers. The Boudin, Bourbon & Beer fundraiser, developed by the Emeril Lagasse Foundation and held each fall in New Orleans, offers an array of craft brews along with, of course, an extraordinary lineup of food.